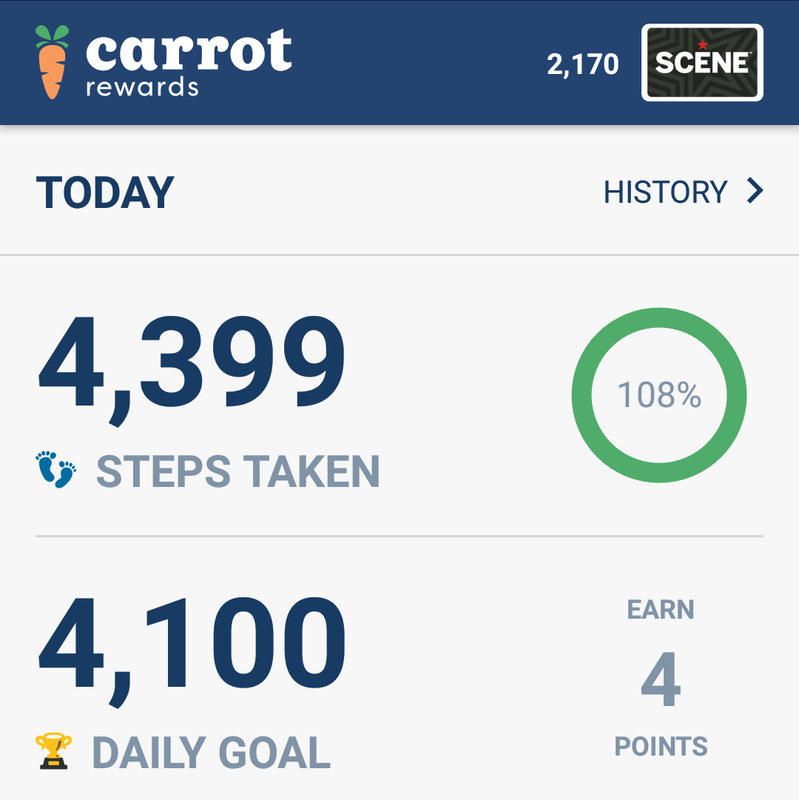 So, there’s this (relatively) new App available called “Carrot Rewards” that I’ve recently started using. It is a government-funded app which claims you can “Complete healthy offers and be rewarded for making healthy lifestyle choices. Earn points every time!”. It allows you to earn points (Petro-Points, Aeroplan, Scene) for completing surveys or through fitness tracking. The surveys are not commercial surveys, they are not based on specific products or your spending habits. Rather, they are aimed at informing you about a topic you may not know much about. Surveys pop up roughly once a week, take less than two minutes to complete and are worth between 5-200 Scene Points. (A free movie costs 1000 Scene Points). The three most recent surveys have been “Live Life, Pass it On” which was about the importance of being an organ donor, “Let’s Get Moving for Mental Health” which was about the connections between physical and mental health, and “Gettin’ Outside” which was about the importance of spending time outside. The Carrot App partners with either a FitBit Product (there are many) or your phone’s built-in fitness tracker to keep track of the number of steps you take daily. For the first two weeks, it keeps track of your daily steps to calculate a daily step goal for you. 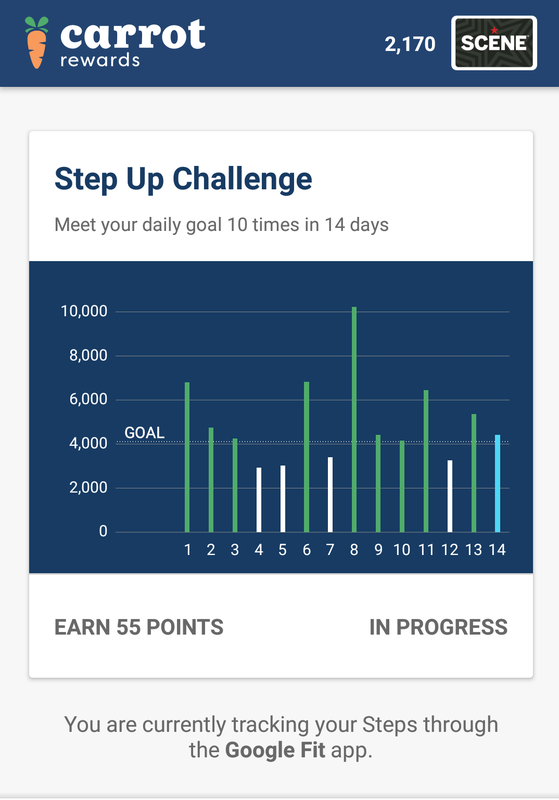 After the initial two weeks, you earn points by completing your daily step goal (I’m earning 4 Scene Points daily which is worth about $0.04 real money). You also earn a bonus of 55 Scene Points every two weeks if you meet your goal 10 or more days out of the 14. Every two weeks, it updates your daily goal based on how often you meet you goal. There are two major cons to the fitness tracking aspect of this app. One, it only tracks your steps. This means any other physical activity you do won’t earn you any points. Two, it currently only partners with FitBit or your phone’s built-in tracker. This means you have to either be always carrying your phone (which I am anyway) or own a FitBit product. As a student (student=poor), I love this app. Usually, I don’t pay to see a movie in theatres unless it’s a something I REALLY want to see. Usually, it’s not. So, I like being able to see movies for free. With this app, I earn enough points to see roughly one free movie per month. I like that the points I earn can be used for something tangible, an actual real-life thing. There are many apps that turn fitness into a game but most of them turn it into a virtual competition (see Samantha’s post about losing Strata segments! ), reward you by posting to Facebook about your activity or reward you with a virtual medal or trophy. Has it increased my fitness levels? Not really. Generally speaking, I walk most places unless it’s really far then I take the bus. But what I have noticed is that I’m more aware of my daily steps. Often near the end of the day I find myself checking how close I am to my daily goal and if I’m close, I’ll make an excuse to go for a short walk (for example to return library books or pick up groceries). I dislike that it only tracks steps. There are days where I spend all day standing and moving around and I feel like it hasn’t been a particularly inactive day. Then I look at my daily step counter and realize how few steps I’ve actually taken. Or if I take the time to do other activities such as swimming and don’t walk very far, I feel like those days should count for something. Has anyone else used this app? What are your thoughts? I have many more including the implications of it being government-funded, issues around accessibility for people who may not be able to walk as easily as I can, etc, etc, etc but I won’t get into them here. Instead, I’ll simply end by saying that this app isn’t for everyone, but for me, I like earning free stuff so I’ll keep using it even if it isn’t perfect. Mallory Brennan is many things. Currently finishing a Certificate in Conducting at Capilano University. Daughter of Samantha (and Jeff! ), part-owner of Cheddar the dog, lover of the outdoors, hater of shoes, singer, conductor, and traveler. Interesting. I love the idea of incentivizing fitness with free stuff. I collect scene points and petropoints already! But I dislike counting steps for prolonged periods of time. Great post Mallory!